Engine is no. 5202 'Panopea', a 'Rebuilt Precursor' in LMS days. Can anyone identify the location and perhaps the train? I cannot identify the location, but the signal is LNWR, the curvature of the track suggests a secondary line, the train hauled by a Precursor or George V 4-4-0 has the air of an excursion. The large building on the hillside on the right appears very distinctive and ought to be recognisable. The scene shows extensive river flooding, possibly abating. I am going to guess the Conway Valley line somewhere near Llanrwst. Is this by any chance the approach to Windermere station? No doubt someone will know if it is not! The photograph is definitely not Llanrwst or anywhere on the Conwy Valley line, no part of which had any double track. The location looks like an inland holiday resort. The curve of the line is consistent with the approach to Windermere. Is Llandrindod Wells another possibility? I don't think it's Windermere - on the approach to the station the land on the left drops sharply down towards the lake. Not Conway Valley � as the line is double track. Not Windermere � signal indicates that the train has just passed a block post, and the line is in a river valley. The buildings do not seem to fit either. Not Llandrindod Wells � no long right-hand curve at that point. But the hills suggest Cumbria, Wales or Derbyshire. The first carriage is LMS, the second is Midland, the rest ex-LNWR mixed corridor and non-corridor. Is it on the LNWR? The shape of the signal arm, the location of the black stripe near the end, the angle of the 'off' position and the distance of the arm from the top of the post - could it be on the Furness? 'Panopea' is heading a return excursion from Coniston towards Kirkby-in-Furness station in Cumberland. Opened in 1846 it was named after the local land owners of the area. To the right of the picture are Duddon Sands. The prominent building looks like it may have been a hotel. It's now four dwellings with a superb view. When the station opened in 1846 it became a transfer point for the slate traffic from the Earl of Burlington or Kirkby Moor Quarries. It ran along the Burlington quarry tramway. There is also reference to a Lady Moyra incline which ran down from the quarry. Much more information is available on the "Old Cumbria Gazetteer" and Wikipedia. I think it's an up train on the Windermere branch approaching Burneside station, land to far right would be flat and the hill to left is possibly the slopes of Potter Fell(?) The only mystery is the home/starter signal. I think, like Alan Budge,that this train is approaching Kirkby in Furness from the North. I don't think it's Burneside, as on the approach from Windermere, there is rising ground to the right of the train, the A591 Kendal - Windermere road at this point being at a higher level than the railway. Also, I found a photo of a diesel hauled charter approaching Kirkby in 1990 on FLICKR. Click here and you'll find the picture of the Class 47 and pristine Mark 2 rolling stock taking the same curve as that taken by Panopea in the Mystery Photo. Note for Alan Budge - Kirby in Furness was never in Cumberland ! Having grown up in Kirkby in Furness , then in Lancashire, I can confirm Alan Budge's identification. The train is approaching the station from Foxfield. The area on the right is marshland alongside Kirkby Pool before it joins the Duddon estuary, the village cricket team played on the other side of the line until about 1950. A short branch line went from the station to Incline Foot where slate was transferred from the bogies which came down the incline from the quarry. A steep hill called Askew Gate goes from the station past the four large houses known as " The Villas" , my uncle lived in number one and as previously stated the view from here was wonderful, overlooking the estuary and the Lakeland hills. 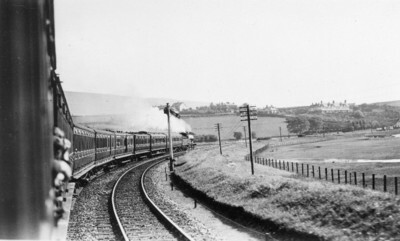 This photo shows the right hand curve of the line from Foxfield prior to reaching the station at Kikby-in-Furness. The train would have passed over the viaduct where,as adventurous youngsters we used to sit on the columns of the viaduct as trains passed overhead!! I used to live at The Villas ( the four dwellings shown at the top right of the mystery photo) which overlooked the railway station and the estuary. The photo brings back childhood memories! !